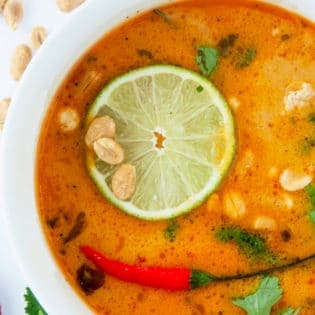 This Thai Coconut Peanut soup recipe makes a delicious and easy dinner. Made with chicken, chili paste, peanut butter, coconut milk, and spices. optional: bird's eye pepper sliced. In a large pot, heat the coconut oil over medium heat and saute the garlic, shallots, and red pepper until soft. Add the chicken, cilantro, liquid aminos/soy sauce, lime zest and juice, peanut butter, chili paste, dried cilantro, cumin, salt, and, pepper. Combine over the heat for about 4-5 minutes, stirring constantly. Add the chicken broth and coconut milk, bring to a boil. Top with cilantro, peanuts and birds eye pepper.